Confidence & Connection Ebook is designed especially for nervous public speakers looking for a unique, individual and mindful approach to communicating with relaxed confidence. Be coherent and clear about your message and purpose and find your authentic voice. 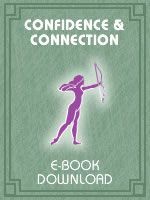 Confidence & Connection EBook 1 is a low cost, fast pdf download and available immediately. An added bonus within its pages are hyperlinks to four MP3 sound recordings voiced by speaking coach Geraldine Barkworth. Crafting & Presenting is the second book of the Free Your Inner Speaker Series, a companion to Confidence & Connection Ebook. It is designed to build on your new found confidence to help you craft compelling, meaningful words and presentations. You can buy Confidence & Connection Ebook (43 pages) as a stand-alone self-study course for $65.